Explore the lives of monarch butterflies with Ranger Rick in this beginning reader with full-color photos of monarchs in the wild! What if you wished you were a monarch and then you became one? Could you transform from a caterpillar into a butterfly, and learn to fly? And would you want to? Find out! Ranger Rick explorers can learn all about monarch butterflies in this reader full of fascinating facts, vivid wildlife photographs, a Wild Words glossary, and a hands-on activity that teaches kids how to chart the life cycle of the monarch. Ranger Rick, the iconic raccoon ambassador from Ranger Rick magazines, engages young readers by comparing and contrasting the life of the monarch to the life of the reader. For example—when explaining how monarch butterflies eat, a call-out from Ranger Rick asks: do you sip juice through a straw? 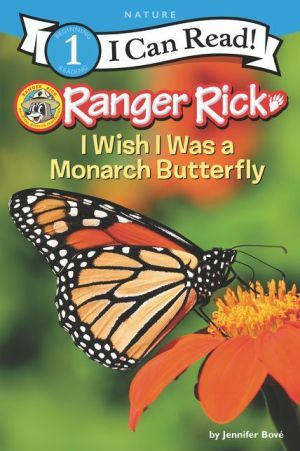 Ranger Rick: I Wish I Was a Monarch Butterfly is a Level One I Can Read book, which means it’s perfect for children learning to sound out words and sentences.